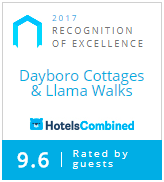 Combining warm hospitality and luxurious accommodation, Dayboro Cottages and Llama Walks was designed as a very special and unique retreat. You will find us situated 3.5 km along Mt Mee Road from the Dayboro township, approximately 45 minutes from the Brisbane CBD and airport. Whether you are a couple looking for that romantic getaway, a group of friends reuniting, a family holidaying, a lone traveller needing a bed or just looking to escape and unwind, you will be sure to enjoy the peace and quiet and the gorgeous views over the Dayboro Valley in one of our beautiful dwellings set amongst natural bushland and mountains.